A total of 70 units were sold at Fourth Avenue Residences on the first weekend of launch (Jan 19-20). 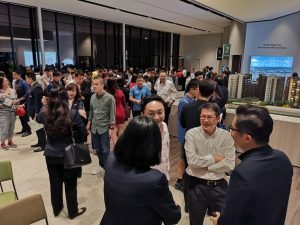 Property developer Allgreen Properties Ltd said this represents 42 per cent of the 168 units released in phase one of the residential condominium located off Bukit Timah Road in prime District 10. The 99-year leasehold Fourth Avenue Residences, which is located within a Good Class Bungalow area achieved an average price for units sold in the first phase of $2,375 per square feet (psf). Prices for the low-rise development in prime District 10 start at $1.05 million for its one-bedroom units (474-517 sq ft), while the biggest unit – four-bedroom plus study (1,475-1,496 sq ft) – starts from $3.387 million. These prices include a 5 per cent plus 3 per cent early bird discount. The developer said that about 85 per cent of the buyers of Fourth Avenue Residences are Singaporeans. Singapore Permanent Residents and foreigners made up the remaining 15 per cent of buyers. Allgreen added that about 70 per cent of the buyers are residents in prime Districts 10 and 11 as well as those in the fringe areas of Districts 5, 15 and 21. 70 per cent of the units sold at Fourth Avenue Residences were one- and two- bedroom apartments while three- and four- bedroom units made up the remaining 30 per cent. Fourth Avenue Residences feature a mix of 1 to 4 bedroom units, all of which are well-appointed. The units spacious and those with extra rooms give residents an opportunity to convert some spaces into study rooms, offices or guest rooms. Further, each unit in the condo provides breathtaking views of the adjoining suburbs and the luxuriant greenery around. That brings an aura of freshness and convenience to the occupants of the apartments. Fourth Avenue Residences is the only project with a direct covered linkway to the Sixth Avenue MRT Station. The development is close to The Grandstand mall as well as National Junior College and Nanyang Girls’ High School. The exact location of this condominium is at 2 Fourth Avenue. “As a developer, I believe that one must build from the “heart” to be able to consider the persons that the building is for.” – Lee Yew Kwung, CEO, and Director of Allgreen Properties Limited previously said. The Fourth Avenue Residence is actually a 99 years leasehold condo project, which may be viewed as not that attractive, as compared to the freehold land that surrounds it. However, Allgreen Properties sees this land as one of the most promising and valuable land in Singapore. Therefore, they didn’t hesitate to take this land and develop it. Now, they are launching a condominium complex that provides the most desirable environment to live for the prospective home owners and investors. The most outstanding attributes of Fourth Avenue Residences is the proximity to Sixth Avenue MRT Station, as it is almost literally right next to the train station. This is probably what made Allgreen Properties and 6 other developers to fiercely contest for this plot of land. Fourth Avenue is located in a central location in Singapore, it is well connected to may expressways like Pan Island Expressway (PIE) and Ayer Rajah Expressway (AYE) as well as the Dunearn Road. This means getting to major business hubs, the busy Orchard Shopping area and the Central Business District is just within minutes. Fourth Avenue has a number of top-notch facilities which can make life for residents a lot more convenient and fun. Some of these facilities include swimming pool, 50-meter lap pool, tennis courts, gymnasiums, BBQ pit spots and clubhouse. The condo also has a sky pavilion that offers stunning views of the surrounding Good Class Bungalows and Bukit Timah Hill and a grand lawn perfect for hosting special family and/or friends gathering. The leisure pavilion is equipped with landscape lighting that combines with the pool and perfectly set seating area to create a mesmerizing ambience at night. With the convenience of MRT station right besides, investors can rent it out easily and at the same time expect potentially good capital appreciation, and for buyers making this their home, it is easy for them to commute around and enjoy potential capital appreciation, and thus, it is a win-win situation for all. Is there any good if a condo is freehold and situated far away from good transport infrastructure, but yet, it is hard to rent out and dimed the potential of capital appreciation? Allgreen Properties paid $1,540 psf for the land on which Fourth Avenue Residences it. And with the development selling at $2,375 psf, is the proof of the great decision made by Allgreen Properties to take this land for their project. Allgreen has appointed ERA, Huttons and Knight Frank as the sales agents. Shouldering the cost of purchasing a unit or two at Fourth Avenue Residences alone can be quite heavy, especially if your savings are not enough. That means the only viable option to getting the desires unit(s) quickly is by getting a home loan. And when it comes to that, we’ve got you covered. At iCompareLoan mortgage broker, our specialty is in helping home seekers compare home loan Singapore and find packages that match their home purchase needs. With us, you have numerous loan packages to choose from and reputable lenders to contact for loans, something which puts you at a position of getting a loan quick and seamlessly.